Welcome dreamers, creatives and the like! Recently it was my husband's birthday, and I decided to use a learning opportunity for me, on making a gift for him. In addition to my own personal fursuit mask, I am adding his to my current projects! And let me just say how excited I am for this! 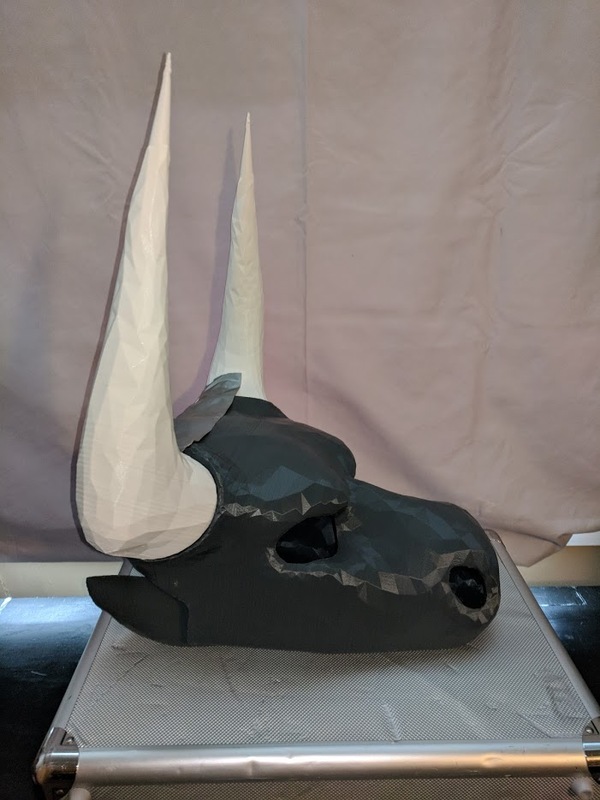 Once again with the awesome help of Talon Windstryke, I had the model I had made of my husband's personal character, Marius Octavius Aurelius - The Bull Dragon, 3D printed! Above, you can see the results of Talon's efforts to get the model to work. There was a lot of troubleshooting and multiple failed attempts that resulted in plastic spaghetti. I was worried at some points that due to the limitations of the 3D printer, we might not be able to do it, or that we would have to make the mask too small for my husband's head. I did learn from doing my own mask that it was easier to separate the jaw from the mask before printing it. Doing this luckily gave us enough space to print the top and bottom halves separately. Once those were complete, it was time for the horns; and they turned out absolutely fantastic! They were printed specifically to fit into the sockets of the headbase and are incredibly lightweight for how large they are. They turned out incredibly durable and will eventually be secured with heavy duty earth magnets so that we can detach them when the mask isn't being worn. Doing so will hopefully protect them from too much wear and tear over the years (as protecting other things from being impaled by them haha!). I am incredibly happy with how this project is turning out so far and I am looking forward to the next step in completing this, as well as my own mask. Additionally, I am considering purchasing my own 3D printer (So I can stop hogging Talon's printer), so that I can offer things like this; mask bases, custom figurines, and so on. What sorts of 3D printed things would you be interested in buying? If I were to open sponsorships to fund getting a 3D printer, would you be interested? What if I sweetened the sponsorships with not just a portrait, but maybe some additional perks? Let me know in the comments below!